February 2014 was another light traveling month for Isadora, filmmaker of the Red Tent Movie: Things We Don’t Talk About. She attended just two movie-related events, and only one screening. However, what was lacking in quantity was made up for in quality: included in the events’ heart and soul-warming moments was the “most inspirational experience” Isadora remembers having in her year and a half of touring the country with the film. On February 8th, she returned to Escondido, California, where she had last been in mid-September 2013 shortly after the Goddess Spirit Rising Festival in Malibu. On her previous visit, too exhausted from travel and facilitation to set up the Red Tent, she had held a bare-bones film screening in the Goddess Studio, a sacred temple space on the home property of Amalya, who was one of the festival’s presenters and is also a writer, belly dancer, priestess, teacher, and ceremonialist. 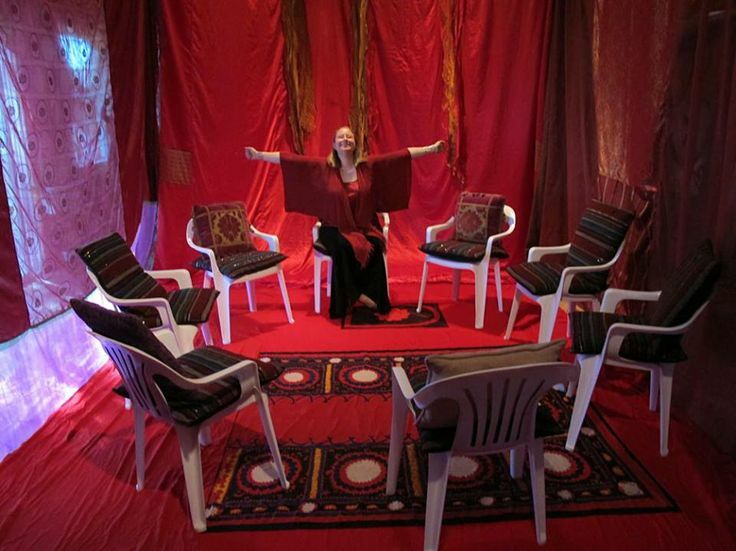 However, Amalya, inspired by the Red Tent at the festival, had invited Isadora to return later for a full Red Tent experience in the Goddess Studio. That return took place on February 8th. This time, the full set of red fabrics came out for an all-day event which quickly became a moving and intimate experience. The four-hour-long Red Tent, attended by eight women and co-hosted by Amalya and Isadora, took place in three parts. First, the women participated in a ten-minute sound meditation, created by a woman, Duffy, whom Isadora had met at a screening in January. The meditation guides listeners through an imaginative journey into what it might have been like to participate in an ancient moon lodge or menstrual hut. (Isadora plans to make this meditation widely available by selling CDs and offering it at all future Red Tents that she hosts.) As the women lay on the floor in a circle, heads touching, their bodies like sun rays radiating from the center, they realized that the red fabric panels hanging from the ceiling created a yoni shape that could only be seen when looking directly up at them. The power of perspective! Red River is flowing back unto Thee. A woman I will always be. Goddess, carry me back unto Thee. After this Red Tent, which with its tears, laughter, and “aha moments for all of us,” qualifies as Isadora’s “most inspirational” film touring experience so far, the day concluded with dinner in Amalya’s house and a movie screening. Nine more women showed up for the screening, including Roberta Cantow, a documentary filmmaker who created a three-part film about honoring menstruation, called Bloodtime Moontime Dreamtime: Women Bringing Forth Change. 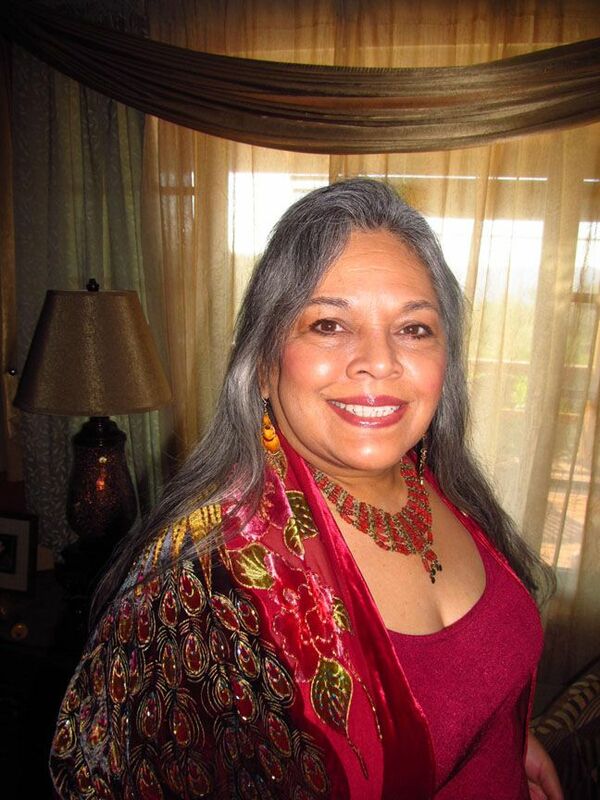 Roberta was one of Isadora’s inspirations and influences as she was creating the Red Tent movie. It was thus very meaningful to have her present for a screening—inspiration had clearly come full circle. Isadora’s Chicago home was the site of the next Red Tent, on Sunday, February 23rd. Ever since she moved to the city in the summer of 2012, just before Things We Don’t Talk About was released, her community has supported her as she has traveled and worked on behalf of the film. Now it was time for those community members to experience a Red Tent for themselves. The event, which lasted seven hours, was an extravaganza of self-care, as women gathered, rested, ate chili, drank tea, polished their nails, and gave and received foot rubs. Two very young baby boys, neither older than eight months, were present with their mothers. Nurturing was in the air. And, for Isadora, it was particularly special because her mother-in-law, a longtime supporter of the Red Tent movement and film, was there for her very first Red Tent experience. Nervousness quickly gave way to relaxation as she received a foot rub from her daughter-in-law; the two women bonded in a new way. The day included a veil dancing ritual inspired by the one Isadora experienced in Escondido; like a seed on the wind, it is already traveling. This ritual and others like it, grown in the womb of the Red Tent, are falling like soft grace over women’s lives, welcomed by first one community, then another. May they facilitate the holy birthing of more and more women into their true selves. After a December hiatus, Isadora, filmmaker of the Red Tent Movie, Things We Don’t Talk About, was back in attendance at several movie screenings during January 2014. First up was the Washington, D.C. premiere (one of two for the month, the other being the Kentucky premiere) on January 12th. Sponsored by Birch Moon, an emerging community healing space created by local woman Teresa Duncan, the event was a double feature with two screenings and two Red Tents held back to back. The basement of a home was transformed into a Red Tent space packed with attendees, many of whom were members of two Red Tent communities in the area (Bethesda, Maryland, and Arlington, Virginia, both of which were featured in the film). Isadora described the event as low-key and authentic, a gathering of women who enjoyed meaningful networking, good food, and relaxed socializing. Later in the month, Isadora visited California and attended two more screenings. The first, on January 24th in Topanga Canyon, took place at a home within the canyon. Winding roads led attendees to the top of a mountain; getting to the screening was an adventure in itself! The Topanga Canyon Red Tent community (led by Megan Greene), which has been meeting in the area for the past three years, hosted the event. Twenty women enjoyed the combined screening and Red Tent gathering; these included women of Iranian, Ukrainian, Hungarian, and Mexican descent, making it quite a diverse group. Isadora noted the beauty of hearing many different languages spoken in the Red Tent. The women literally wove themselves together during the talking circle, using a ball of red yarn which they passed across and around, forming a web that grew as each woman spoke. Introducing herself by calling in the names of her matrilineal ancestors, every woman had an opportunity to share what was happening in her life through the lenses of joy and compassion, the themes of the gathering. This was especially poignant for Isadora, whose maternal grandmother passed away in December 2013. “I am Isadora, daughter of Teresa Moorehouse, daughter of Ella Knapp, daughter of Rita Haviland,” she said when it was her turn, affirming the abiding strength of the women whose love helped form the foundation of her life. The love and strength of the mother-daughter bond was shown in another deeply immediate and tangible form when the mother of host Megan Greene, who is pregnant with her first child, shared with great pride and joy how good it feels to witness and be present with her daughter as she holds life within her body. Matrilineal links are not only something from the past; they are being forged all the time. The second California screening took place the next day in Canoga Park, at a clubhouse within a retirement community. It was sponsored by the House of the Goddess, a women’s organization that also hosted the Goddess Spirit Rising conference in September 2013. Laura and Delphine (Duffy), leaders of the organization, met Isadora when she attended a Red Tent Movie screening at the conference and asked her to return for another screening for their community. Although the screening and following Red Tent was only attended by about 10 women, due to many members of the community being sick with the flu, Isadora described the experience as fun. Canoga Park, CA Red Tent Screening. –One attendee, who is a belly dancer, taught and led a session of belly dance. –Duffy shared a guided meditation CD she created, leading women through what it might be like to be inside a moon lodge or menstrual hut in ancient times. The CD was such a hit that Isadora was inspired to make it available for sale (coming soon), so more women can have the experience. –Women participated in an activity seeking to turn the concept of “mean girls,” girls and women who engage in negative self-talk and corresponding destructive behavior, on its head. Phrases that encapsulated the mindset of a “mean girl,” such as, “I’m not good enough,” or, “I gossip about others to make myself feel better,” were placed in a bowl. When women drew them out, they offered a countering message for each, turning them into positive self-talk and constructive, empowering actions. And that wraps up the January screenings; more screenings to come next month!